Twenty-five miles northwest of Augusta is the impressive Gibson Dam. Standing at 199 feet high and 960 feet long, the structure was built in the late 1920s as part of the Sun River Project. 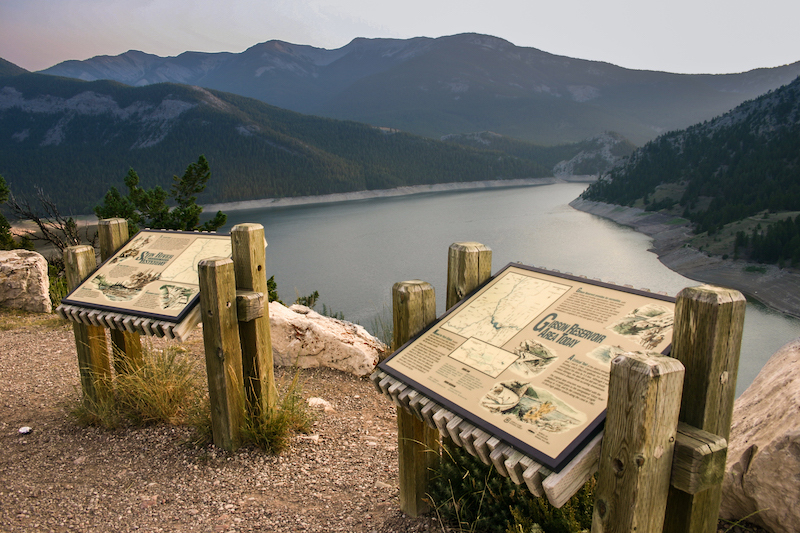 Instituted by the Bureau of Reclamation, the project’s primary goal was to develop irrigated land in the Sun River Valley. Today, Gibson Dam and other units of the Sun River Project irrigate over 90,000 acres, where wheat, oats, barley, and alfalfa are grown. A secondary benefit of Gibson Dam’s construction was the prevention of springtime floods. Between 1950 and 1999, the dam prevented an estimated $3 million in flood damages. The only time water overtopped the dam was in 1964, when floods throughout the state caused millions of dollars in damage (and several fatalities). It’s frightening to think how much worse it could have been without Gibson Dam acting as a barrier.